Ian Moore, born in 1926, has lived in the Latrobe Valley, Victoria, most of his life and developed asbestosis from working as an electrician at the State Electricity Commission of Victoria (SECV). First he was an apprentice electrician at the SECV for five years and after a stint driving trucks Ian returned to work at the SECV in 1964. Since his diagnosis in 2002, his disease has progressed to server asbestosis. 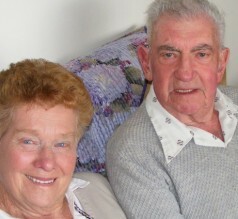 Betty Moore, who has been married to Ian since 1951, supports and cares for him every day. Here, they share their experiences. Asbestos was used in lagging on the steam pipes and electrical cables in the SECV power stations. When Ian worked for the SECV the workshop doubled as the crib room where the workers ate, so even when they had their lunch they were exposed to asbestos, as they would sit amongst the various lagging repair works that were carried out in there. Ian recalls repairing electrical cables after a small fire caused damage. He and other workers were then called into work two weekends in a row, where they plastered lagging around the cables to protect them from further heat damage. The workers mixed water and asbestos together to form a paste and during this process the asbestos dust would disperse into the air. Ian was never warned about the dangers of asbestos exposure. On the contrary, he recalls how “the big bosses” once told him it was safe to eat asbestos. Being diagnosed with asbestosis in 2002 came as a shock to Ian. Before then he thought it would never happen to him. His disease makes performing some basic tasks very difficult and so his wife, who he calls his “right hand woman”, is there to help him all the time. Betty Moore describes the day Ian was diagnosed with asbestosis and how his illness makes her worry about his welfare all the time. Ian has lost many of his former work mates to asbestos related disease over the years. Ian is so starved of oxygen that he must use an electric scooter to get to and from the local shops, as he finds walking too strenuous. Despite this, Ian is still not eligible to receive an oxygen concentrator free of charge from the Government funded equipments program. GARDS currently lends him an oxygen concentrator for free, which he needs to use twice a day to ease his breathing difficulties.